National Post headline: "Morsi's departure leaves legacy of danger"
The overthrow of Mohamed Morsi in Egypt delights and worries me. Delight is easy to explain. 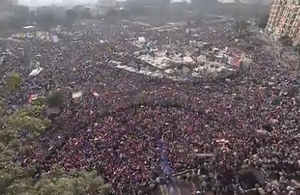 What appears to have been the largest political demonstration in history uprooted the arrogant Islamists of Egypt who ruled with near-total disregard for anything other than consolidating their own power. Islamism, the drive to apply a medieval Islamic law and the only vibrant radical utopian movement in the world today, experienced an unprecedented repudiation. Egyptians showed an inspiring spirit. 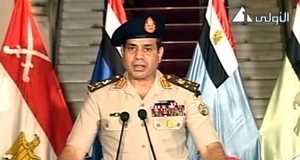 Abdel Fattah al-Sisi announcing Morsi's removal from office. If it took 18 days to overthrow Husni Mubarak in 2011, just four were needed to overthrow Morsi this past week. The number of deaths commensurately went down from about 850 to 40. Western governments (notably the Obama administration) thinking they had sided with history by helping the Muslim Brotherhood regime found themselves appropriately embarrassed. My worry is more complex. The historical record shows that the thrall of radical utopianism endures until calamity sets in. On paper, fascism and communism sound appealing; only the realities of Hitler and Stalin discredited and marginalized these movements. In the case of Islamism, this same process has already begun; indeed, the revulsion started with much less destruction wrought than in the prior two cases (Islamism not yet having killed tens of millions) and with greater speed (years, not decades). Recent weeks have seen three rejections of Islamist rule in a row, what with the Gezi Park-inspired demonstrations across Turkey, a resounding victory by the least-hardline Islamist in the Iranian elections on June 14, and now the unprecedentedly massive refutation of the Muslim Brotherhood in public squares along the Nile River. The crowds in Egypt this week have been numbingly large. But I fear that the quick military removal of the Muslim Brotherhood government will exonerate Islamists. Egypt is a mess. Relations between pro- and anti-Muslim Brotherhood elements have already turned violent and threaten to degenerate. Copts and Shi'ites get murdered just because of their identities. The Sinai Peninsula is anarchic. The incompetent and greedy military leadership, which viciously ruled Egypt from behind the scenes between 1952 and 2012, is back in charge. But the worst problems are economic. Remittances from foreign workers have declined since the upheaval in neighboring Libya. Sabotage against the pipeline sending natural gas to Israel and Jordan ended that source of income. Tourism has obviously collapsed. Inefficiencies mean that this hydrocarbon-producing country lacks the fuel to run tractors at full capacity. Socialist-era factories churn out sub-par goods. Egypt imports an estimated 70 percent of its food and is running fast out of hard currency to pay for wheat, edible oils, and other staples. Hunger looms. Unless foreigners subsidize Egypt with tens of billions of dollars of aid a year into the indefinite future, a highly unlikely scenario, that hunger looks unavoidable. Already, about one out of seven poor families have cut back on their food intake. 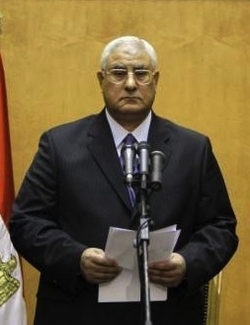 Adli Mansour, the interim head of government. Looming over all these dangers, the Ethiopian government exploited Egypt's weakness a few weeks ago to begin building a dam on the Blue Nile that could entail a reduction in water being supplied to Egypt from 55 billion cubic meters to 40 billion, a move that has incalculably negative implications for life in the country known as the Gift of the Nile. As these economic disasters hit, the year-long interlude of Islamist rule by Morsi & Co., which did so much to exacerbate these problems, may well be forgotten – and whoever inherits the rule will take the blame. In other words, the pain Egyptians have and will go through may be for naught. Who knows, they might in desperation turn again to Islamists to pull them out of their future predicament. Likewise, the Muslim Brotherhood's brief time in power means other Muslim peoples will also not gain as they should from Egypt's dire experience. On another subject, Lee Smith of the Hudson Institute speculates that Egypt's new rulers will see a short war with Israel as the only way to "reunify the country and earn Egypt money from an international community eager to broker peace," as well as "return Egypt to its former place of prominence" in the Middle East. Such a war would likely achieve none of these goals – Egyptian forces would probably get clobbered, leaving the country yet poorer and weaker – but one cannot discount this possibility. Egypt's military leaders have many times before engaged in follies against Israel. In short, my joy at Morsi's departure more than offset by my concern that the lessons of his misrule will not be learned. Instead, the bitter adherents of the Muslim Brotherhood and other Salafist groups (and at a later stage the youth in Tamarod once they realize that they were wronged again) might learn an entirely different lesson, an ominous one played out in other revolutions: the beheading of potential counter-revolutionaries in a manner they themselves refrained from doing after Mubarak's ouster. Related Topics: Egypt | Daniel Pipes receive the latest by email: subscribe to the free mef mailing list This text may be reposted or forwarded so long as it is presented as an integral whole with complete and accurate information provided about its author, date, place of publication, and original URL.